If there’s one aspect that the films of Rob Reiner exhibit, it’s that of being self-aware. While the majority of his work is in comedy, he does it in such a way as to poke fun at the genres his movies reside in (much like Mel Brooks does). He pulls apart the genre and looks at its roots so that he can create a story that will show how ridiculous some of the trappings of particular genres really are. Take his work, When Harry Met Sally . . . (1989) for instance. On its surface, it shows all the elements of a modern romantic comedy. And yet, how Billy Crystal and Meg Ryan interact is something more realistic than a story that is coincidental, cliche, and hackneyed, like many romantic comedies tend to be. He was aware of the limitations of the genre and found a way to fix one of its significant flaws. This week’s two movies highlight two more of Rob Reiner’s genre-aware films. First up is the fantasy genre. Usually set in far off lands with strange beings and pre-renaissance structures, fantasy stories can go one of two ways. First, it can be the adventure story of a man on a mission. Secondly, it can be a story of true love. 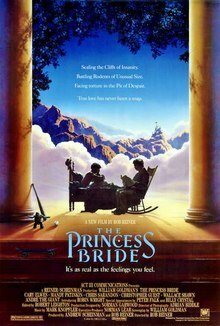 The Princess Bride (1987) is definitely the latter, but with elements of the first (since there are no defined boundaries in this genre). What really makes The Princess Bride self-aware is its dialogue. The characters act and speak in such a way that is comedic, but still within the confines of a fantasy film. Perhaps this is why much of the movie’s dialogue is quoted, even today. At any rate, a storybook story like this really shines with the final piece of the puzzle: framing. With framing, the story can exist in its own world, but with a link back to reality. The framing of The Princess Bride is that of a grandfather (Peter Falk) reading a “kissing story” to his sick grandson (Fred Savage). On a farm in the land of Florin, Buttercup (Robin Wright) falls in love with the farmhand, Westley (Cary Elwes). However, when Westley is rumored to have been killed by the Dread Pirate Roberts, Buttercup resigns herself to marrying Prince Humperdink (Chris Sarandon). Yet, before she can get married, she is kidnapped by some outlaws, only to be rescued by a man in a black mask: the Dread Pirate Roberts. Buttercup is enraged that she was saved by the man who killed her true love, but once she learns his true identity, she willingly returns to Prince Humperdink in order to protect him. Now, can the Dread Pirate Roberts make it to the wedding in time to stop Buttercup from marrying the prince? With the success of the television show, The Office, the “fake documentary” has really reached the forefront of popular culture. Even with its American adaptation (which has been more successful than its British predecessor) and the somewhat spin-off of Parks and Recreation, the genre of the documentary is used to tell a story by blatantly breaking the fourth wall. And yet, decades before the fake documentary (or mockumentary, for short), Rob Reiner created a film that really defined the mockumentary genre that we know today. By using the structure and styling of a documentary on a fake subject, Reiner created something that was aware that it was a documentary, without actually being a documentary about anything that existed. 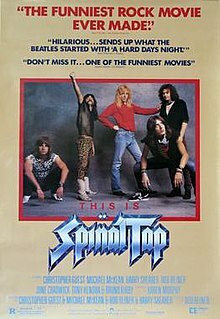 This is Spinal Tap (1984) follows the hair metal band known as Spinal Tap as they try and make a comeback by staging an American tour of their music. Following them along with camera in tow is Marty DiBergi (Rob Reiner) who is their biggest fan, and is ready to document their tour for posterity. Unfortunately, the documentary camera is non-discriminatory as it shows quite a few failures that cause the band to start to unravel. With amplifiers that go all the way to 11, miniature sets of Stonehenge, and black-on-black album covers, the loudest band in existence is on a downward spiral during a trip that was supposed to garner them more groupies than they would know what to do with. Even though DiBergi wanted his film to be a rockumentary, it inevitably captures the band’s demise. tagged as A Few Good Men, Rob Reiner, The Princess Bride, This is Spinal Tap, When Harry Met Sally . . .